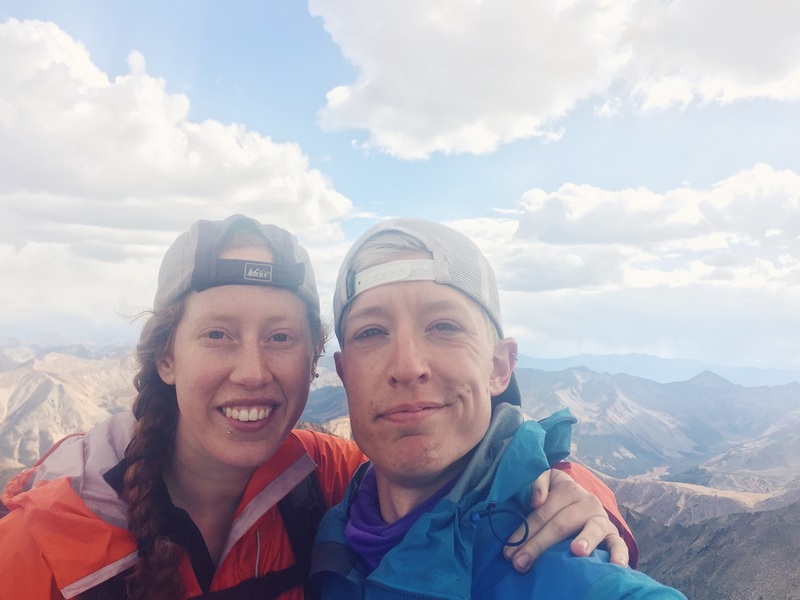 If you have been following Dan and Jonathan's blog since its inception, you may remember a certain red-haired tagalong who started popping up about halfway along the PCT when she and Jonathan hiked a double marathon together (the *real* one). 900 miles later, there she was again, photobombing their monument pictures. When the boys realized that they hadn't booked a ride back to STL, it was Ms. Frizzle and my Magic School Bus on loan, who came to the rescue. (Or at least, that's sort of how it happened...). After leaving these fine fellows in St. Louis, I drove back to Vermont to live off the fruit of my parents' table for a few months while splitboarding the East's finest backcountry. You might say that a life of free rent and powder refills sounds pretty good. And it was. But I just couldn't leave these guys alone. Somewhere along that 900 miles, I fell in love with Jonathan and to my delight, he agreed to go on another crazy adventure in which we moved from our respective homes here to Boulder, CO to play in some really big mountains. Daniel even moved out to Golden, CO, just down the road, putting the third wheel back on our PCTricycle (Or is that me?). I've shared a lot of great stories with the Captains of Us, and I may pop up once in a while to tell a story or two when these clowns are taking themselves too seriously. I think its realistic to say I outrank them. The natives call these mountains the "14ers": the 54 peaks in Colorado above 14,000ft in elevation. There are websites, even an app, dedicated to the pursuit of summiting the whole set. 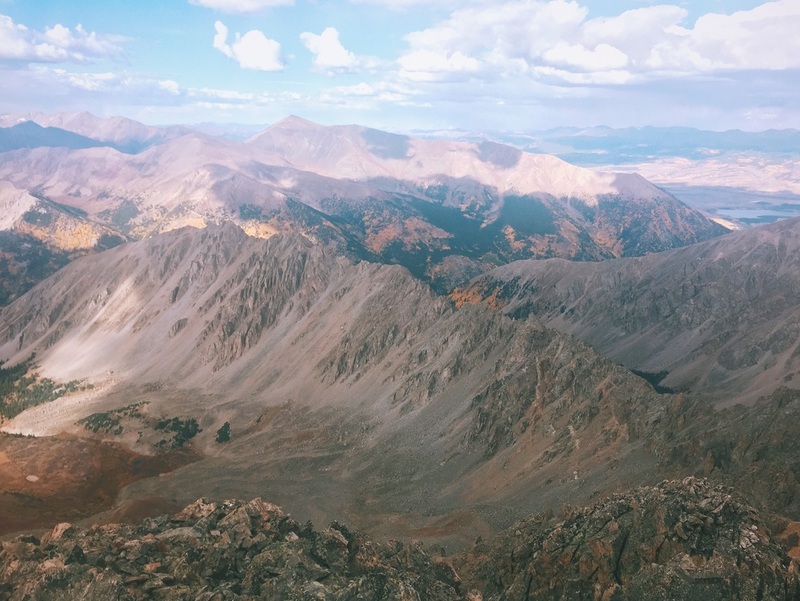 Since arriving in Colorado in April, Dan, Jonathan and I have collectively summited 10 of them, but this past week, Jonathan and I got a little ambitious and decided to do a few more. Ok, a lot more. Taking 4 days off, we decided to attempt a route through the Sawatch Range developed for a challenge known as "Nolan's 14". This challenge, that some insane athletes complete in under 60 hours, goes up and over fourteen 14ers by the most expedient possible route, which can vary slightly depending on who you ask. On average, to complete the challenge, you have to cover between 90 and 110 miles and do 44,500ft of climbing, or, about 3.5 times the amount needed to summit Everest from Base Camp. Much of this is off-trail route-finding and, as we soon discovered, much of that is scambling over sketchy, loose scree at 13,000ft. Check out the details of the route here. No problem. We have 4 days and we're in good shape, right? Right? On Day 1, we wake up to a frosty car window and put the heat alarm on snooze for a few more moments in the relative warmth. It is cold already at 9,500ft, but we start up the trail and we both feel strong as the sun comes up. Mt. Massive is the second highest peak in Colorado, the largest contiguous area above 14,000' in the U.S. and our first challenge of the day. Instead of taking the Class 1 trail up this rockpile, the route takes us up the shorter North Ridge, a steep Class 2 scramble. Huffing and puffing up the last few hundred feet we see someone heading down toward us. "Wow, he's moving fast!" exclaimed Jonathan. The guy was wearing only a running vest for his pack and was jogging off-road down the slippery rocks. When we came up to one another, he asked where we were headed and we explained our plan to hike the Nolan's 14 route. The guy grinned. He said, "I'm just finishing up!" What?! "Actually," he continued, "I think I'm about to set the speed record!" His GPS was at 51 hours. We asked him his name. Sure enough, when we got home there it was "Andrew Hamilton breaks speed record on Nolan's 14". Check out Andrew's website here for some inspiration. Back to us, we had just barely made it to peak #1. It felt great. And look at that view behind us! Mt. Elbert looms in the distance as we hiked through a lovely valley. On to the next! Peak #2 is Mt. Elbert, the highest peak in the Rockies, at 14,433'. 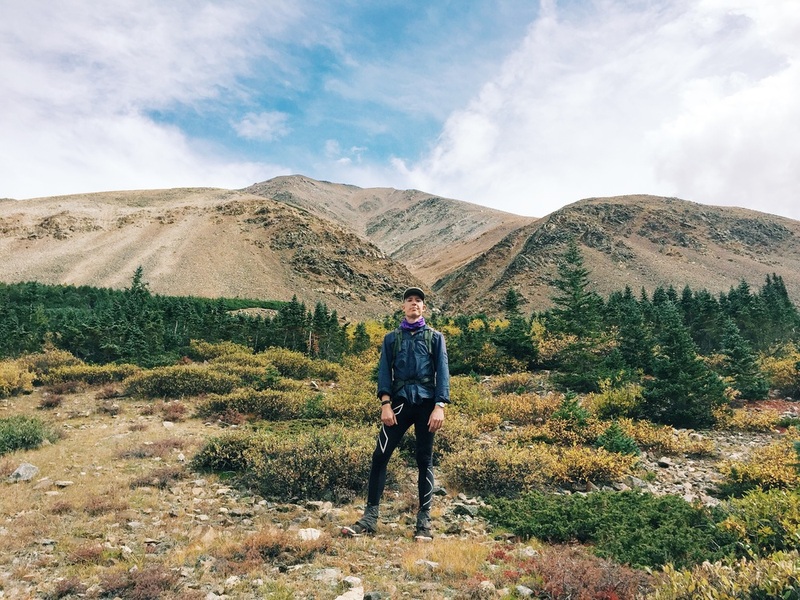 Usually known for being one of the easiest 14ers, it turns out that Elbert has a dark side. (Its the west one). Instead of cruising up Class 1 trail on the East Ridge, which would add lots of mileage, we ran down the back side of Massive, hiked up a 4WD road to the West Ridge and proceeded to climb 3,000 vertical feet over 1 mile on extremely loose, football sized rock-missiles. Do people really do this during a speed attempt? Jonathan in front of Mt Elbert. Our route went up the ridge on the left. Nearing the top and closing in on 8,000ft of climbing for the day, we were working for that summit. (read: I felt like I wanted to die). It even started snowing on us: Happy Autumn! Suddenly, we heard someone cheering us on. I heard Jonathan say: "They're so close! There's someone on the summit and they're so close!" Motivated, we pushed onwards to the summit. 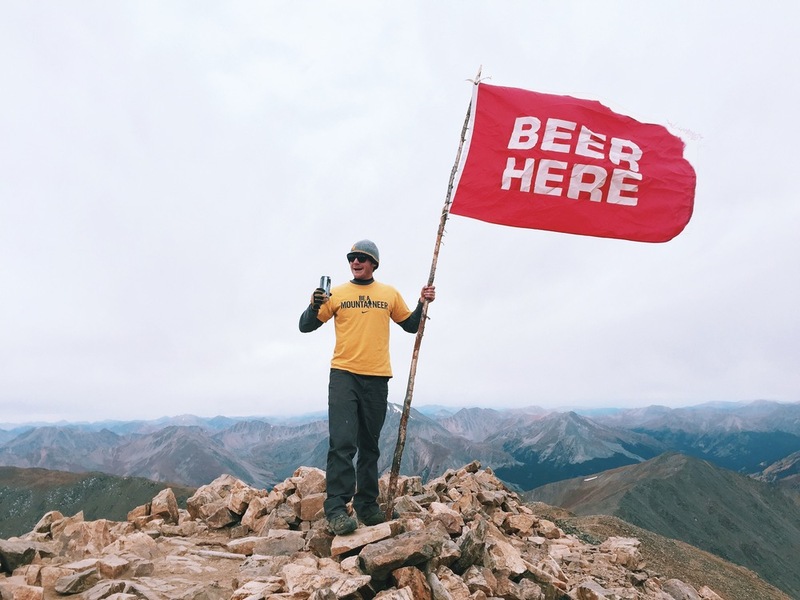 At the top of the Rockies, we enjoyed a new view as our cheering squad erected his "BEER HERE" flag and cracked a tall boy. His friend was wearing a "DRINK WATER" sweatshirt and did not take photos with the flag, although it sounded like he had carried the small tree for most of the hike. Mr. Keystone Ice told us it was his first 14er. (Yea... we know). Jonathan and I were pretty wrecked after that climb and as we ate our summit snacks, we both realized that we were burning through food way faster than we had anticipated. We wouldn't have enough for even two more full days of snacks, and looking at the maps, we also realized that the best, and maybe only, opportunity to hitchhike back to the car for a resupply would come on Hwy 82, right on the other side of Elbert. So, we changed our plans. It got dark as we finished our descent to the highway and we cowboy camped near the road, talking about our changing expectations. Before we left, we'd been impressed by the athletes who completed Nolan's 14 in just 60 hours. After just two peaks and just under a quarter of the elevation gain required to complete the route, we were astounded. After about 13 hours, covering 22 miles and over 8,000' of elevation, it wasn't that we were behind schedule. We were just ready to sleep. Soundly. Not do another 40+ hours of hiking. Instead, we had a great night's sleep, and woke up to a beautiful morning. Did I mention that it's autumn in the high country? The aspens glowed that morning, amber against the sunrise as we walked down the highway, waiting for a hitch. Jonathan captured this majestic shot of the aspens in the morning light. Not a whole lot of traffic, but what a lovely morning for a walk! Highway 82 is a direct route to Aspen so after a stream of dapperly dressed folks in their Priuses drove past without flinching, a pickup truck was a welcome sight. An older gentleman pulled the truck to the side of the road and motioned for us to hop in the back. Hooray for pickup hitches! The view from the back of the truck. After two easy hitches, we made it back to the car, drove into Leadville and made a new plan over delicious coffee at City on a Hill Coffee & Espresso. New plan: hit La Plata Peak (#3) that afternoon, then drive south to hit the two southernmost peaks the following day. La Plata was a steep hike, but the trail was relatively easy-going and the weather was gorgeous. We were sore from the previous day's hike, but we made it up to see another mind-blowing view. It was an uneventful evening, but we had fresh food waiting at the car, so we were in great spirits as we drove south to the Angel of Shavano Trailhead, close to the southern terminus of Nolan's 14. I wasn't feeling great the next morning, but the sun was up and off we went. The trail up Mt. Shavano follows the Colorado Trail for a few miles of stunning aspen glades and well-manicured path, then juts upwards through a forest of Krummholz trees to a high saddle. 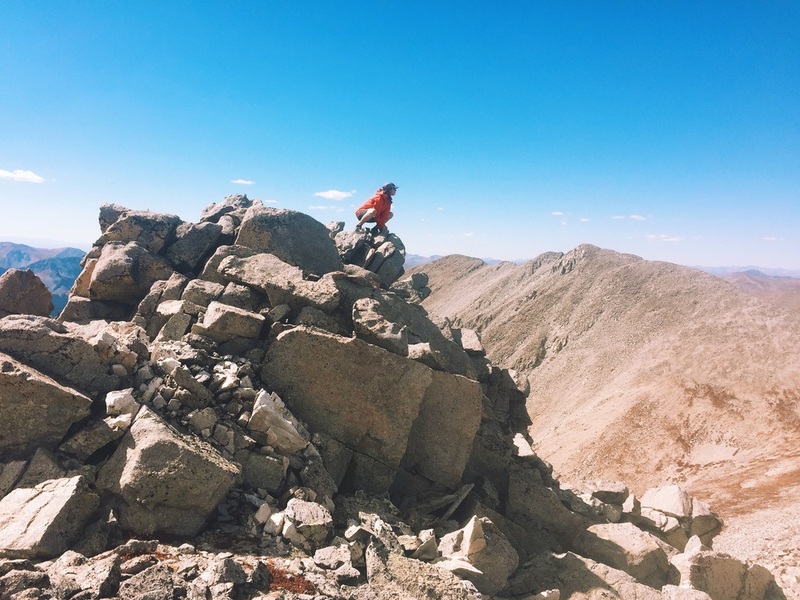 Mt Shavano and Tabeguache Peak (say: "Tabawatch") are close together, connected by a gorgeous rocky ridgeline, and after snack breaks on both (of course), we felt like we had done enough for one weekend. Jonathan doesn't want to go back to work after the Summit of Tabeguache. Molly enjoys watching over Tabeguache Peak as the Gargoyle of Shavano. Finally on our last descent, we decided to take Friday to rest and recuperate our bodies before returning to work on Saturday. For good measure, we ran down Shavano, jogging the last few miles under a golden roof in the late afternoon sun. The ambiance of an aspen grove in late afternoon as the leaves turn golden is an almost unparalleled experience. So unbelievably serene. That evening, a little sore and pretty tired, we drove up to Breckenridge to meet up with Washpot, who Jonathan had met on the PCT, and his girlfriend, Charlotte. Back at their place, we scarfed down a whole pizza and talked about tiny homes with a stunning view of Mt. Quandary (a 14er in the Tenmile-Mosquito Range). Washpot enlightened us with an answer to a questions we've been pondering since arriving in Colorado: Does high altitude give everyone gas? The answer? Not everyone (Charlotte was quick to explain), but almost. 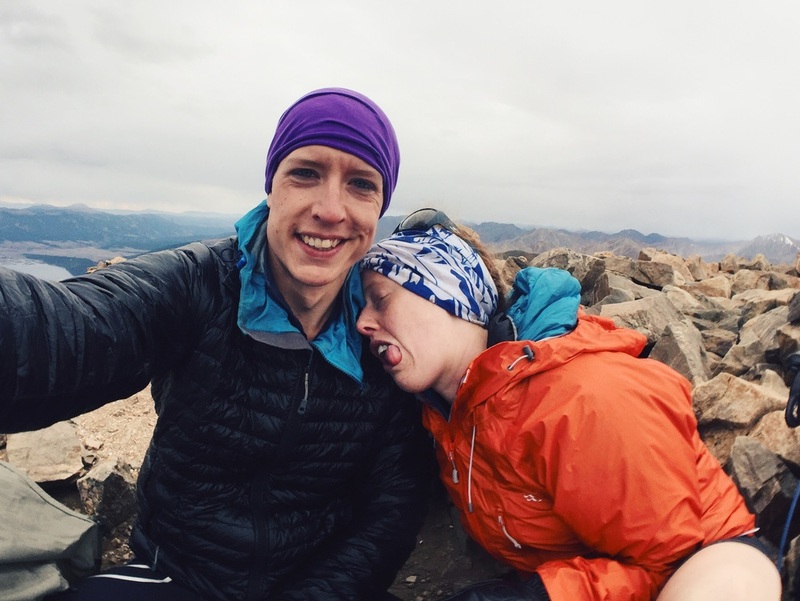 Coloradans have a name for this syndrome: HAFE, or, High Altitude Flatulent Expulsions. Well, now we know. On our three day mini-adventure, and within 60 hours, we had hiked about 50 miles, climbed approximately 18,000ft (about 1.5 Everests) and bagged 5 peaks. Plus, we had two good nights' sleep! Even without going for speed, the rocky terrain and consistent high elevation were hard on our bodies and we would have been very hard pressed to hike for more hours than we did. We learned that, more than anything, Nolan's 14 is about brutal endurance: the willingness to push for hours, and when it gets hard, to push harder. In terms of the challenge, we completed only 35% of the peaks (5 of 14), but over 40% of the total elevation gain as well as about half the mileage (with some different routes, of course). We also slept for approximately 18 hours and drove for 3.5 to 4 hours. The rest was mostly eating, with some hiking interspersed in there. Let's just say, we came back with a healthy respect for the athletes who complete the whole thing in that same time frame. Maybe one day, we'll come back and bag the rest of the peaks. Perhaps someday, we'll even have a fighting chance at completing the challenge. For now, I'm pretty pleased with the fantastic days we spent hiking in these beautiful mountains. Altogether, not bad for a weekend.